Yes! 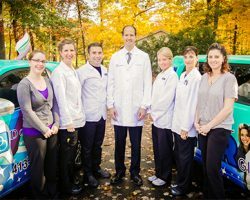 Our longmeadow, MA dentist’s office has an adult orthodontic treatment program that utilizes a series of clear, virtually invisible plastic aligners to correct crooked, crowded or gapped teeth, without attracting any unwanted attention. Whether you are interested in Invisalign for your teenager or for yourself, all you have to do is get in touch to schedule an orthodontic consultation with Dr. Dores!